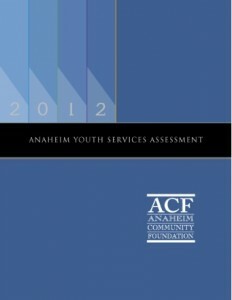 The Anaheim Community Foundation is non-profit corporation established in 1984. 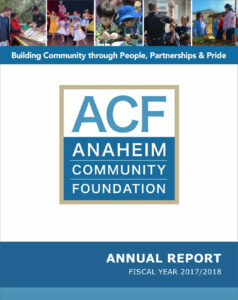 The Foundation supports a broad base of programs, services, organizations, and facilities that enrich the lives of Anaheim residents. A volunteer Board of Directors provides leadership and manages donations to ensure they are returned to the community to meet vital community needs. Strengthen community-based organizations to address community needs. In today’s melting pot society, young people need positive alternatives to gangs and other risk factors. ACF grants and scholarships help develop self-esteem while promoting personal and community responsibility. Projects emphasize the value of staying in school, job training, and outlets for organized recreational activities for youth, teens and adults. ACF provides community support to enable facilities such as libraries or Pearson Park Amphitheater to provide affordable opportunities for families to experience music, dance and theater arts. Not all of our fellow citizens have the physical abilities to participate in the many community activities. ACF is committed to assisting those with disabilities to develop their own social skills with confidence and independence by supporting programs for seniors, therapeutic recreation, and various human services.